Eve Environmental Services: How Do You Make The Most Out Of Your Lawn And Garden Services? Anyone who owns a garden knows that effective garden maintenance requires a lot of time and patience. It is a task that demands skills and sufficient knowledge on using garden equipment that are necessary to keep up the beauty of a lawn and garden. If you desire to have this additional attraction in your home or you already have one but do not have the appropriate training or time for this, there are expert individuals who can care for your lawn and garden for a fee. It would also be good to have an idea on how to maximize their services. The following things will help you do just that. You should determine whether you want some changes in your yard, a total make-over or just some tidying up and this should be clearly discussed with the service providers. When you have established what you want, it would be easier for you to determine how you can maximize the services rendered by these experts. Since they will be handling your lawn or garden, your suggestions and opinions regarding what to change or replant should be counted in. If major gardening methods like alterations in landscaping or uprooting a tree is an option, discuss it well with the crew or you will regret it once renovations will start. Have at least an idea of the fundamentals of gardening. In this way you can state your opinion in case you want to add something else to the look of your garden. This will also be your license to understand what will be done during the entire process. Search for reputable gardening service provides and scout for feedbacks. Ask your friends if they can recommend one to you. Perform a background check and see to it that they have a good reputation when it comes to gardening. You should also note if they have many clients. Since you will be spending a significant amount of money, it is important to do some research. Read online reviews, ask neighbors and inquire directly from the company. Make sure they give you the best answers you need to be able to assess if they deserve to be hired for the job. In line with this, you should also take a look into the company's portfolio. These are photos of the expert's previous works and these are good enough to measure the capabilities of the contractors. Looking at their portfolio will likewise give you an idea of what kind of work they deliver. You can also use the same to help you decide on how you want the work to be done. This is done to get a feedback about his work and it is a way of gaining insight about the quality of work done. Remember that a good lawn and gardening services company has no inhibitions in giving the contact numbers of his previous clients. Ask about service packages as some lawn and garden service providers include scarification, aeration and spraying in their packages. Do not hesitate to ask for freebies and discounts. Together with this, you must also inquire if their services are all year round. 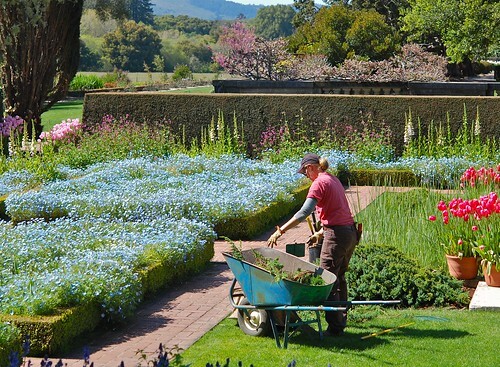 Some gardening services close during certain seasons and it is quite difficult to find one especially during the off season. Read the contract carefully before signing it. Check if the use of fertilizers and pesticide will be included or if there is a separate payment for this. Check for the time frame for the contractors to finish their job. You are the client and as the saying goes 'the customer is always right'. Demand for organic or natural gardening if you want to. You know very well that chemicals should be avoided as it can damage the environment and it is harmful to human beings. You can also ask for anything else you want but be ready to listen to their suggestions too. If you have pets that stay in your lawn or garden, inform the staff about it and make arrangements as to how they can be handled during grass trimmings, water sprinklings and other gardening activities. Remember that pets tend to be disturbed easily by alterations in their environment and if you do not want to disturb them then you might as well seek the help of these experts when it comes to such concerns. Always learn to cooperate with the service provider at all times. Hiring lawn and gardening services in Adelaide might be a daunting task for you to handle. However, as long as you have hired the right person or team to do the job, you will be able to maximize the entire process to your advantage.